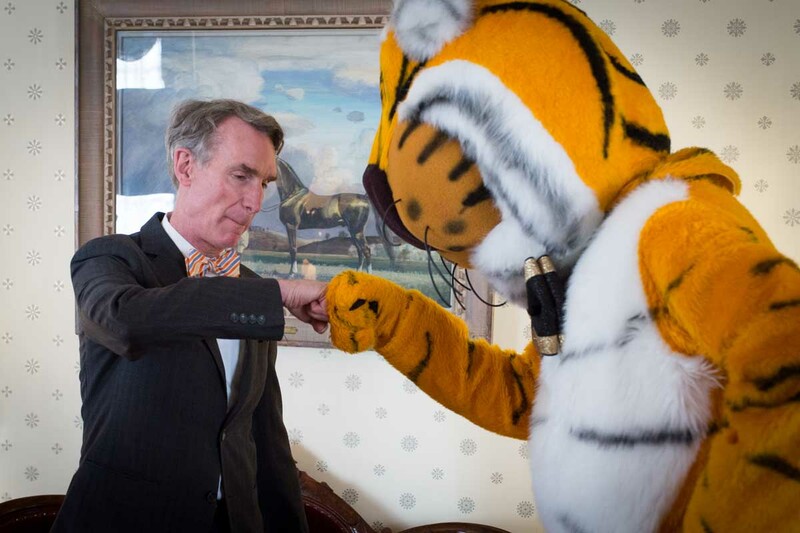 Science educator Bill Nye, Chancellor R. Bowen Loftin and Truman the Tiger straighten their bow ties at the Residence on Francis Quadrangle before heading to Jesse Auditorium for Nye's lecture during the Life Sciences and Society Symposium, Decoding Science. 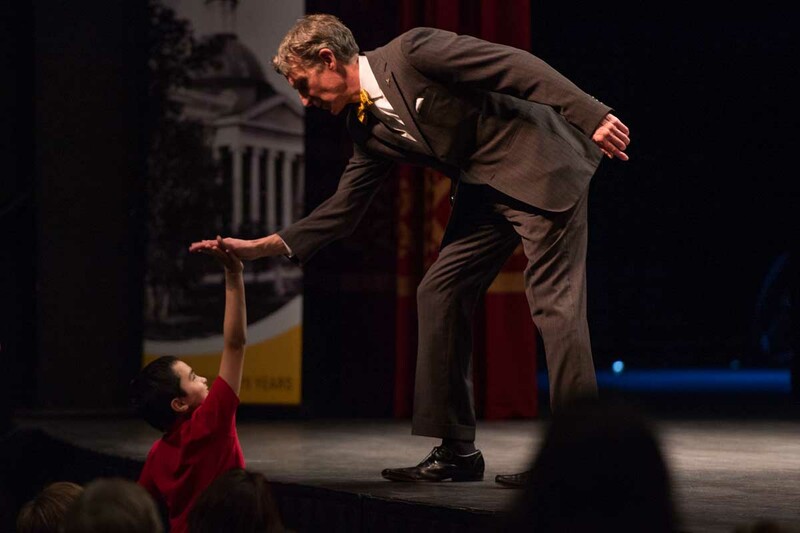 Science educator Bill Nye visited Mizzou March 15 to lecture at the MU Life Sciences & Society Symposium, Decoding Science. 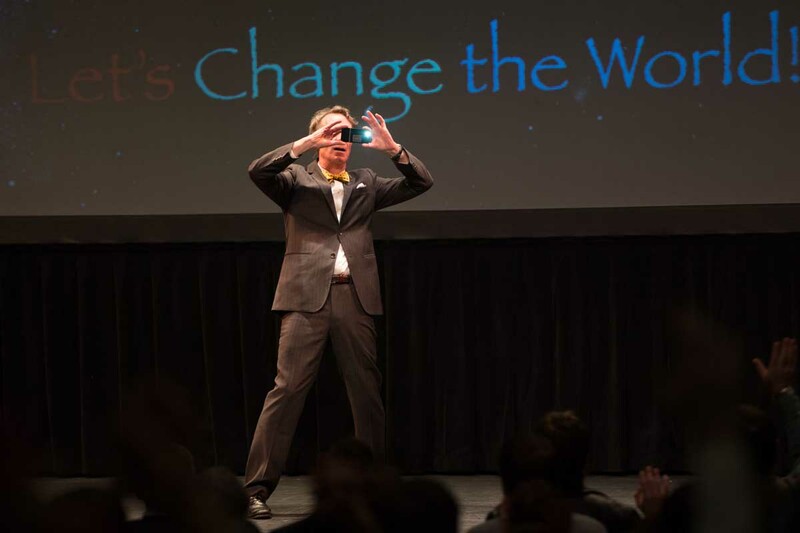 The popular scientist, engineer, comedian, author and host of the Emmy-winning 1990s TV show Bill Nye the Science Guy addressed a sold-out, all-ages crowd in Jesse Auditorium. 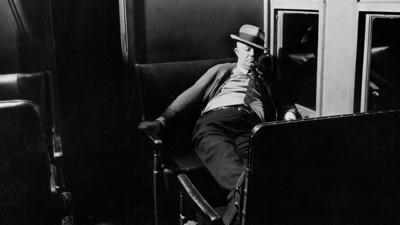 He encouraged young people in the audience to embrace the joy of discovery and to change the world. 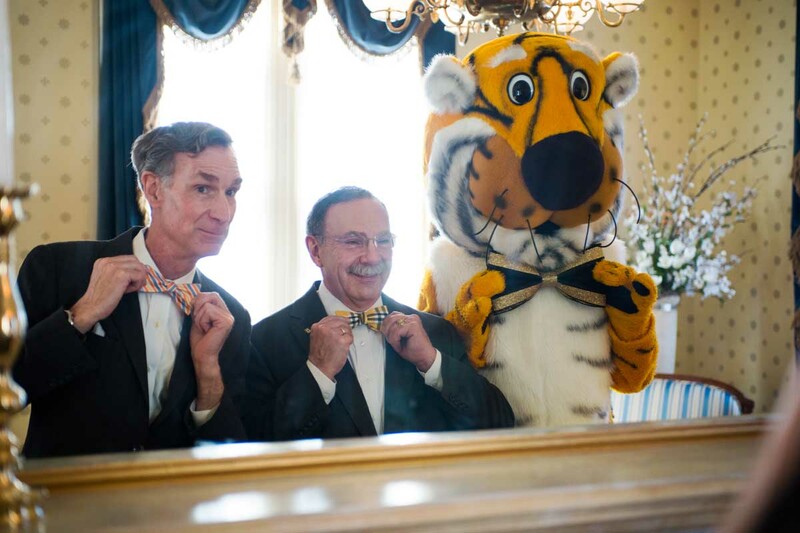 He also bonded with fellow engineer and bow tie enthusiast Chancellor R. Bowen Loftin. 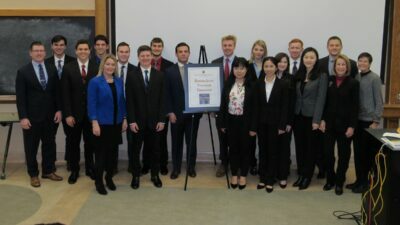 Other speakers at the symposium, held March 10-15, included Rebecca Skloot, author of the best-seller The Immortal Life of Henrietta Lacks, Barbara Kline Pope from the National Academy of Sciences and filmmaker Randy Olson, author of Don’t Be Such a Scientist. 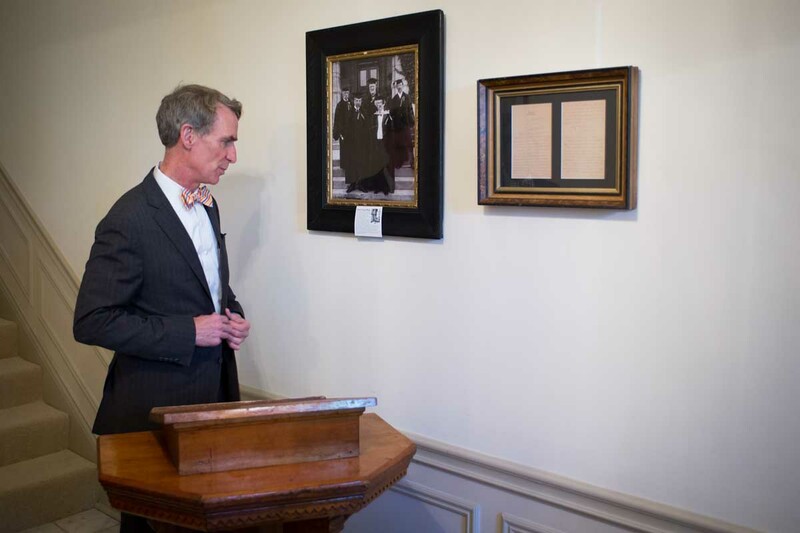 Bill Nye pauses in front of a lectern once used by Mark Twain to look at a photo taken in 1902 when Twain, aka Samuel Clemens, received an honorary degree from the University of Missouri. 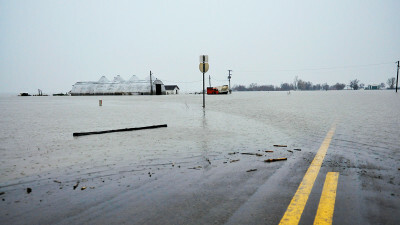 Other recipients that year included St. Louis philanthropist Robert Somers Brookings, U.S. Bureau of Plant Industry Chief Beverly Thomas Galloway, U.S. Secretary of the Interior Ethan Allen Hitchcock and U.S. Secretary of Agriculture James Wilson. Safety first! 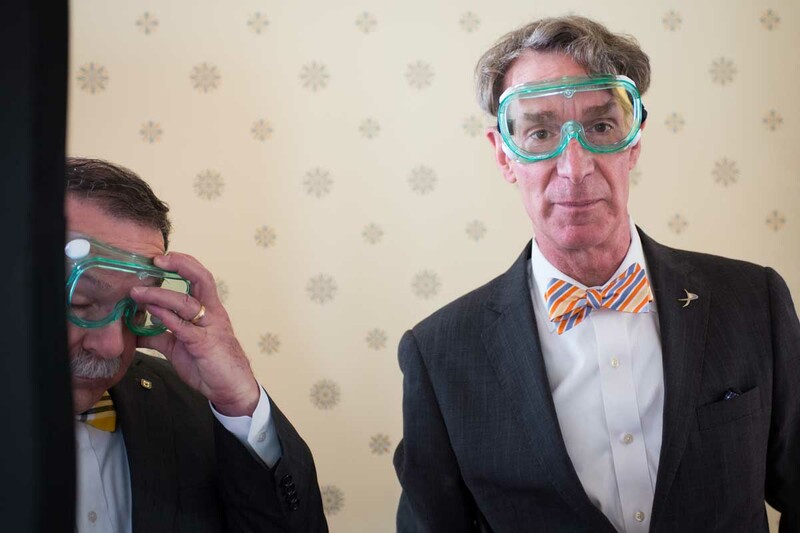 Chancellor Loftin and Bill Nye adjust their goggles and get ready for science. 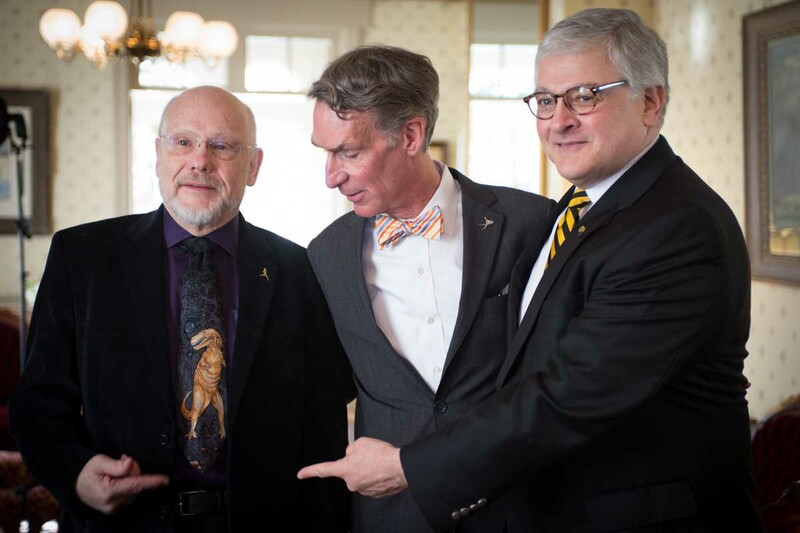 Jack Schultz, left, director of the Bond Life Sciences Center, discusses his dinosaur tie with Bill Nye and Hank Foley, MU's newly appointed vice chancellor for research and graduate studies. 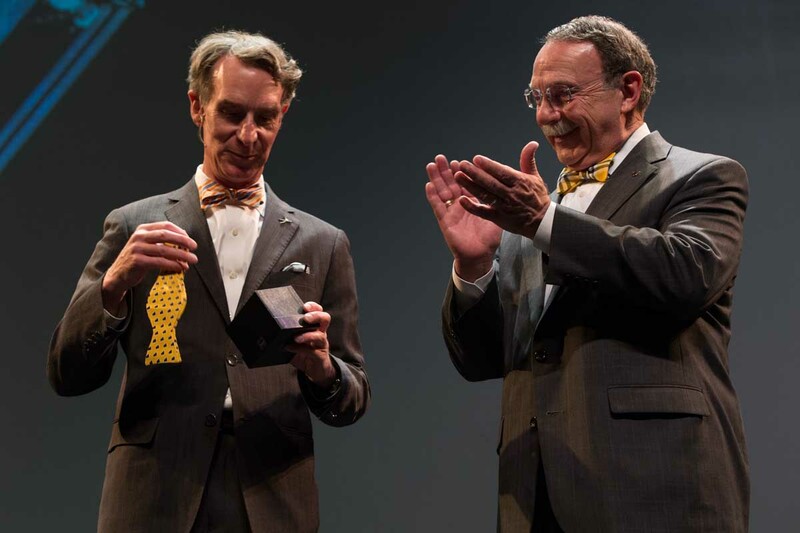 As Bill Nye takes the stage in Jesse Auditorium, Chancellor Loftin presents him with a black-and-gold bow tie printed with tiny maps of Missouri. 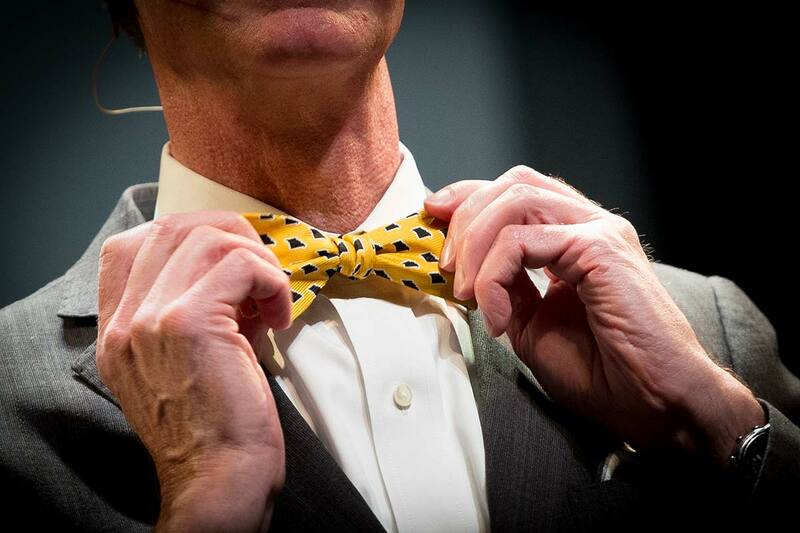 As he dons his new Missouri tie, Bill Nye explains to the audience how to properly adjust bow tie length. 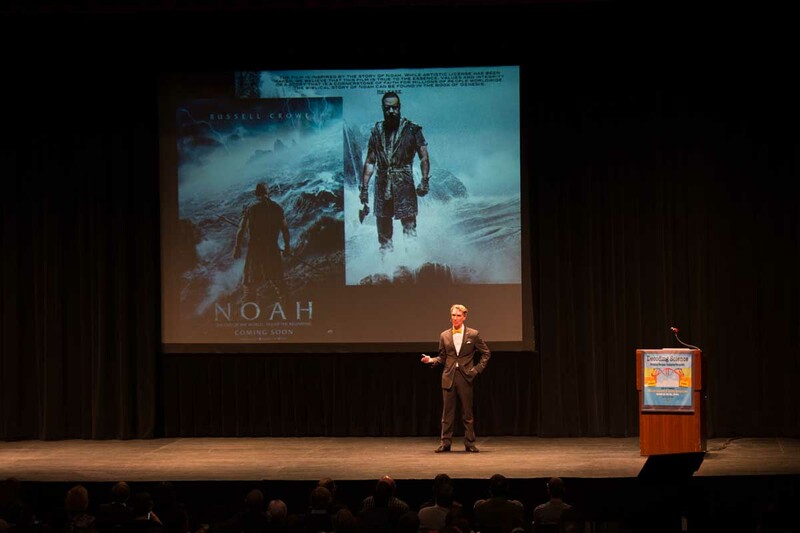 During his Decoding Science lecture in Jesse Auditorium, Bill Nye discusses the intersection of Bible stories, popular culture and scientific knowledge. Bill Nye takes a moment to record the sold-out Jesse Auditorium crowd during his lecture. He urged young audience members to change the world through several important undertakings: a sustainable-energy-powered giant battery, asteroid deflection, algebra-education reform and improving the lives of women and girls around the world. Bill Nye high-fives a young fan during the question-and-answer session. 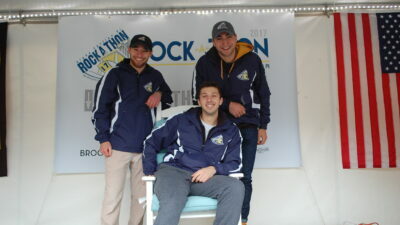 Attendees gushed with excitement at the chance to meet a childhood hero.